Planning to gift a mug as a keepsake item from your wedding and want to theme the enclosure in the same theme as your DIY wedding invitations and wedding day stationery? With the likes of mug boxes that are available in different colours, textures and finishes, you can do just that for a beautiful look when presenting this gift to your guests. 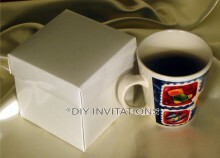 It comes in two pieces, that is, as a lid and base, and measures at 110mm x 110mm x 110mm as a cube.